06/10 – Newtype #07 – Drop. 23 (on sale). 07/09 – Newtype #08 – Drop. 24. 08/10 – Newtype #09 – Drop. 25. 06/09 – Bessatsu Shonen Magazine #07 – Chapter 205 (on sale). 07/09 – Bessatsu Shonen Magazine #08 – Chapter 206. 08/09 – Bessatsu Shonen Magazine #09 – Chapter 207. No new additions for XXXHOLiC. A new illustration drawn by CLAMP will be published in Summer Wars Official Comic Anthology. 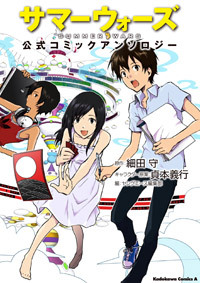 The publication is the official anthology for Madhouse’s movie Summer Wars released in 2009. The book will be released on July 03. Interesting, CLAMP doing Summer Wars! I’m looking forward to it as well ! That’s true! Indeed the chara design reminded me of Evangelion. CLAMP and Summer Wars? I love it already! I can’t wait to see the Summer Wars illustration! !